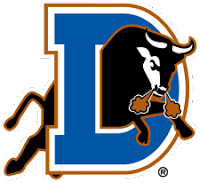 The Durham Bulls finished the week with a 5-2 record, improving to 32-23 and still holding the lead in the International League Southern Division by 6 1/2 games over Gwinnett. This week marked the third time in which a Bull has won pitcher of the week honors with Jeremy Hellickson winning his second one of the season. Voting has begun for the AAA All-Star game, go online to vote now and send your favorite Bulls to the game in Allentown on July 14. Desmond Jennings: .245 AVG, .311 SLG, .339 OBP, 7 doubles, 6 RBI’s and 12 stolen bases. Transactions: Matt Joyce added to roster from Charlotte (5/31/10). Kelly Shoppach added to roster for MLB Rehab Assignment (5/31/10). Rashad Eldridge transferred to Montgomery (6/1/10). The Week Ahead: 6/5/10-6/7/10: at Syracuse Chiefs (32-22). 6/8/10-6/11/10: vs Buffalo Bisons (31-24).